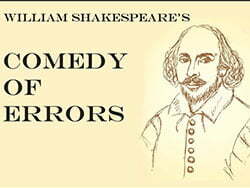 Hastings College Theatre is wrapping up it’s production year with William Shakespeare’s “The Comedy of Errors,” which runs at Scott Studio Theatre (806 N. Turner Avenue) Thursday through Saturday, May 2, 3 and 4, at 7:30 p.m. and Sunday, May 5 at 2:00 p.m.
“The Comedy of Errors” tells the story of two sets of identical twins who were accidentally separated at birth. When the Syracusans encounter the friends and families of their twins, a series of wild mishaps based on mistaken identities lead to wrongful beatings, a near-seduction and false accusations of infidelity, theft, madness and demonic possession. Ticket prices are $8 for general admission and $5 for seniors and non-Hastings College students. The production is free to Hastings College students. To reserve tickets, email the box office at tickets@hastings.edu.